Pretzer frequently references famous Renaissance paintings and we are encouraged to make the associations amid his oddities and allusions to contemporary popular culture. For example, Pretzer’s depiction of hands, as in the gesticulations of “Blender” (2018) or the fondling touch of the tattooed “Hasenmann” (2018) – evoke Zurbaran and Da Vinci, yet these are pure inventions and wonderfully contemporary. 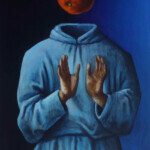 Pretzer’s use of symbolism largely invokes the surrealists but his quixotic choices of characters and narrative is very much his own. He loves to play with historical genres. 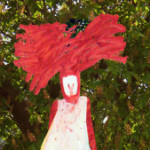 “Portrait” (2018), composed in the classical manner, cropped at mid-torso, is a strange yet captivating figure straight out of Blaxploitation culture – her Afro hair could easily replace the halos from 15th century religious paintings. 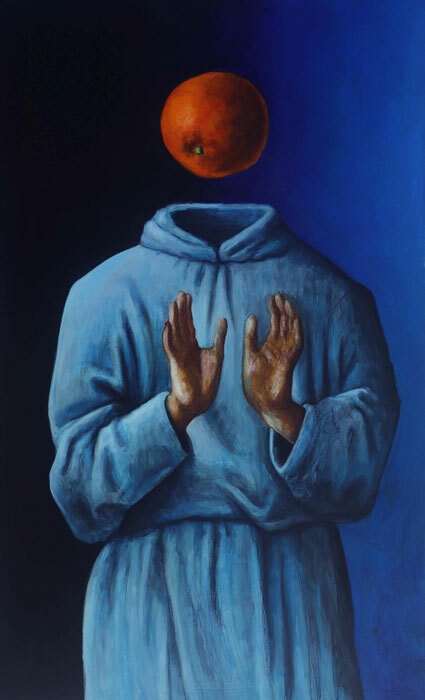 The levitating fruit over the headless friar’s body in “Brüter” (2018) creates an image of disquiet and wonder. Pretzer’s skull in “Wenn Zwei Lachen” (2018) symbolizes that we are indeed fallible; but topped with an apple with a laughing face, we are once again reminded to see the lighter side of life and death.